I wish I lived in a country where it was perfectly acceptable (and affordable) to eat sushi in some shape or form for every meal! That way I might be able to get through trying the whole menu at Miku Sushi, Lincoln Square’s newest sushi joint. 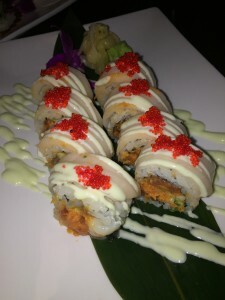 The other week Taste Tester #1 and took a stab at ordering as many maki rolls, nigari, and sashimi as our bellies could hold in order to give you a good idea of what Miku is all about. On the Friday we visited, the restaurant was loud and bustling, filled with a variety of people from a group of bro’s after the Cubs game, to couples out on date night celebrating the end of the week. While Miku isn’t BYOB like a lot of sushi spots around the city, they have a great list of cocktails, beers, and sake. I made the smart decision of stalking the menu ahead of time as it has a wide variety split among 12 different sections: soup and salad, small plates (from the Sushi bar), hot small plates, ramen, skewers, chef’s nigiri, nigiri and sashimi, sushi and sashimi plates, signature maki, Lincoln Square classic maki, traditional maki, and big plates. We started the meal off with the spicy tuna ravioli- it consisted of spicy tuna with house lemon soy sauce, tempura crunch and spicy crab meat wrapped in thinly sliced avocado and sweet soy. Oh man was this good! If you’re a big sushi lover but on a carb-free diet I’d highly recommend this small plate option. Sometimes by the end of a big sushi meal, I get so full from all the rice I end up picking out the innards of the maki roll. This “ravioli” was the perfect answer to that problem and sure looked more appealing than my sushi surgery! There was so much tuna and crab wrapped inside the creamy avocado and I loved the two different sauces that came with the dish. Next we each tried one of their shooters, I tried the uni shooter and TT #1 tried the oyster. In addition to either the uni/oyster it came with caviar, house ponzu, quail yolk, and chive. Neither of us have ever had a shooter before at a sushi restaurant so it was a fun, new tasting experience. Immediately after trying this unique, fresh and creamy combination we wish we had ordered two or three! Alas, there was more to try so we’ll just have to come back for more another time. We felt compelled to try one of their skewers so we went with the chicken thigh marinated in a sweet soy sauce. The thigh was super tender and had a good amount of the marinade lingering on the meat after it was cooked. I wished we had the tummy-space to try more of the skewers, especially the alligator and the bacon scallop! One of my friends and fellow food bloggers, Amanda from The Ghost Guest recommended that we try the chef’s nigiri Hamachi; it was accompanied with goma-ae miso, black pepper, scallion, truffle oil soy. The fish was super fresh and the rice soaked up some of the truffle oil soy which made it a lot more flavorful than a regular piece of nigiri, I also detected a little smokiness to it which I loved. Our sushi feast continued with four different maki rolls. 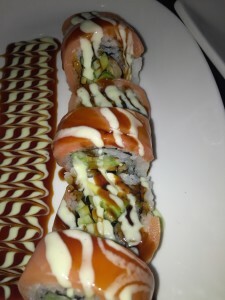 The angry dragon roll was definitely my favorite of the four, it was the perfect balance of sweet and spicy and the shrimp tempura was still crunchy inside the roll which was a real feat with all the delicious sauces on top. We also really liked the uniqueness of the smokey bear which was a lot like a Japanese version of bagels and lox! Overall my experience at Miku Sushi was wonderful! It’s pretty rare that I try out a restaurant for my blog and make plans to go back right away and Miku is a true exception. The menu has such a large variety of options you could take anyone here and they would find something to enjoy.